To read previous episode show notes, refer to my earlier Friday blog posts. This week’s segment includes summaries of four blog posts with awesome book sales tips that will help you push your books off the shelves, and, of course, I have your tip of the week. I usually talk about social media, but today I want to talk about book sales. Every author wants to sell his or her book, right? Sure, we write for the pleasure of creating something and we write because well, we are driven to write. But as Indie authors, you want people to read your stuff. And it would be great if you could get some return on the investment you made in terms of time and money you spent on producing your books. Can social media help book sales? Absolutely! The more contacts I have on social media, the more my books sell. Even though social media works, we don’t want to use it simply to broadcast information about our books and where they can be purchased, right? Social media is about being social and so once in a while we can promote our books but [clickToTweet tweet=”On social media we want to develop relationships with our readers.” quote=”On social media we want to develop relationships with our readers.”]. So what can you do? I have a few tips. More and more authors, especially Indie authors who write fiction are paying for third-party reviews. Do they work? I don’t know, but I have to think that they don’t hurt. If I were to write a fiction novel, I might not pay for a Kirkus review, but I would try to get reviews from the most accomplished fiction writers possible. Next, I would play with the price point of the book. For example, I initially was selling two of my eBooks for about $7.99. About six months ago, Penny Sansevieri recommended that I lower the price to $2.99. The sales increased. So work at finding your price point sweet spot. My third suggestion really has two tips in it: blog as frequently as you can and[clickToTweet tweet=”Grow your email list: Collect email addresses by offering a valuable, free, giveaway” quote=”Grow your email list: Collect email addresses by offering a valuable, free, giveaway”]. For example, I always give away eBooks for email sign-ups. If you hope to find a publisher someday, an agent will ask you how many email sign-ups you have. Besides, it is a great way to communicate directly with your readers instead of through a third-party such as social media. First up is a great blog post I found on the Self-Publishing Review website that has charts on how to select Kindle keywords. These charts are really easy to use. For example, if you write teen and young adult science fiction/time travel books, time travel is the keyword you need to include in your book description. If you write romance, this blogger has a link to Kindle Direct Publishing that tells you which keywords you should use depending on the type of romance book you wrote. For example, if you’ve written a romance novel that includes characters in the Navy Seals, then you need to use the following keywords: military, Navy, Army, and soldier. If you are a memoir writer, then you’re going to want to include nationalities in your keywords. The lists are extensive and cover every genre. So if you’re looking to revamp your book description on Amazon and improve your book sales, be sure to check out this post and follow the links that will reveal the keywords for your genre. Up next is a post by Author Marketing Experts titled Your eBook Deal How-To Guide! 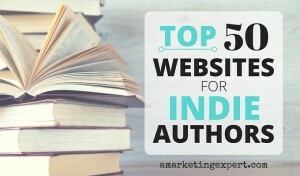 It lists a total of 35 websites that any Indie author can use to help get the word out about your eBook promotion. It’s an incredible list and it’s one for you to save for the future. Penny Sansevieri of Author Marketing Experts wrote another blog post that has a template you can use to prepare for your next book signing. There are tips on what you need to do before your book signing, what to bring to your book signing and great tips on how to appear during the event. Finally, she has a suggestion for what to do after your book signing and a few final notes. You will definitely want to bookmark this page and keep it for future reference. Let me give you some examples. Before your book signing, get a copy of the store’s media list so you can send press releases to them. During a book signing, bring bookmarks, postcards, chocolate (dark chocolate if I’m there), flyers, and your favorite pen. And after the event, send a thank you note to the person in charge of coordinating your book signing. Penny goes on to say do not send an email; send a handwritten note. On the Marketing for Writers website the blogger asked industry experts for their best book marketing tips. When you open this post, you will see tips from Nick Stephenson, Joanna Penn, Derek Murphy, Joel Friedlander, Jane Friedman, and others. You’ll find some great tips here. Chop up the book into a series. Include an excerpt of the next book in each book as a sneak peek for your readers. Refresh its visual appeal by changing the cover. Release a packaged version of blog content or white papers. Joel Friedlander stresses the importance of keywords and using them to help your audience find you. If you just happen to be looking for more time to write so you can spend less time on your marketing, check out my book, Avoid Social Media Time. You will find some awesome tips in this book, which you can pick up for $2.99 on Amazon or learn more about it here. You’re reading the text version of the Social Media for Authors Podcast, written and copyrighted by Frances Caballo.Connect with Frances on Facebook, Twitter, LinkedIn, Pinterest, and Google+. Loved this episode? Subscribe to the podcast on iTunes!